Question: What is a Traction-Lok differential and how will it help me? Answer: This is a great question! A differential upgrade is practically a requirement for anyone looking to tear it up at the strip, so let’s start with some basics: the differential (aka “rear end”, “rear”, or “pumpkin”) is that roundish thing that sits between your rear axles; it’s responsible for transferring power from the driveshaft to the rear wheels and allowing the wheels to spin at different speeds when going around turns. With a job that important it’s easy to see why having a bullet-proof rear is so crucial for serious racers. Drugs are bad, mmkay? Just kidding, we won’t be discussing hallucinogens today. Mustangs came with either an open or a limited-slip differential from the factory. Open (aka Conventional) differentials are quite common and are responsible for peg-leg (one-wheeled) burnouts due to their “path of least resistance” setup. In an open differential, when one wheel starts to slip, all available torque goes to that wheel. If you’ve ever been stuck in a slippery spot with an open differential, you know how frustrating this can be. Limited-slip differentials (LSDs) have ingeniously overcome this problem by using clutches and springs. Before one wheel can spin faster than the other, it must first overpower the clutches, making it more difficult for just one wheel to lose traction; forcing both wheels to spin allows you to put more power to the ground as well. There are several types of LSDs out there and every manufacturer has their own nickname – Ford’s is “Traction-Lok” (aka T-Lok or Trac-Lok). 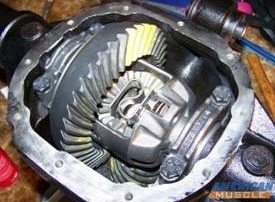 There are a couple options for beefing up your stock 8.8” LSD – you can rebuild your existing diff with a Ford Racing Carbon Rebuild Kit which has the same heavy-duty internals as the Cobra rears; or you can replace the entire carrier with an aftermarket unit like the Ford Racing 31-Spline Traction-LOK differential. Keep in mind that the “31-Spline” part refers to the axles, so your factory 28-spline axles will have to be replaced. More splines = more power potential – 31 spline axles can handle significantly more power than the factory 28s, so if you intend to put serious power down you’ll definitely want to invest in a set. For my fellow V6 owners there are 7.5” Traction-LOK differentials available, although if your six is pushing serious power, an 8.8” swap is also an option. 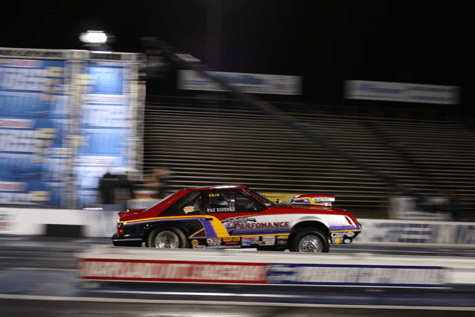 So to recap: by evenly distributing torque between the rear wheels using clutches and springs, a limited-slip differential can help you hook-up at the track and enhance traction in less-than-ideal weather conditions*. Here at AM we offer products to improve your existing LSD, aftermarket units that will be a great improvement over stock, and the know-how to guide you to the right mods for your performance goals. *DISCLAIMER: No differential or modification thereof could have allowed you to drive safely in the 2-3 feet of snow we received here in the northeast recently… although we did not try adding fairy dust to the differential fluid. My poor stang has been sitting in the garage for a few weeks now. Damn this east coast snow! With 295’s on the rear and even with the LSD it won’t go anywhere until we get a thaw. Back in the day of the original musclecars, we drove ’em all year round. Most people only had one car. It was a lot of fun driving in the snow! Come on Zyon, get your stang on the road, where it belongs. Real men drive their cars in bad weather. It’ll put hair on your chest. Keep it sideways year round! driving should be fun! i live in ohio, and my chevy is the one in the garage, i’ve had the mustang in every icy parking lot i could find! My name is Anthony and i have a 2004 V6 mustang. Is it worth even putting time into. Honestly. Absolutely Anthony. Just because you might not have been able to find a GT or couldn’t afford one doesn’t mean you can’t have some fun with your V6. There’s lots of parts out there for that V6. With the light Mustang body, increasing performance on a budget isn’t a problem. You can do a lot with suspension, brakes, exhaust, gears, and air handling. Maybe later you could even do a power train swap. Look for people who’ve done upgrades on their GTs and pick up their cast off factory GT parts. The V6 Mustangs share a lot of parts with the GT anyway, but there are many that are unique to the GT too. What is great about the aftermarket parts market for Mustangs is that you can do it a little at a time. Good luck and have a good time. I also have a 04 Mustang V6. Two questions for you are, Why can’t I find a cold air intake for that year? and will a V6 sound good if it I dual it out? I want to hear a little rumble, even though I won’t get that GT rumble. It’s cheaper than buying a full CAI and on the V6s you see about the same power gains as you would from a CAI. I have 2007 GT/CS, and had a set of sub-frame connectors Installed….WOW!!! What an upgrade….if you do anything to your stang….sub-frame connectors are a must!!!!! Hey Heather, if I buy this http://www.americanmuscle.com/ford-31spline-88-carbondisc.html will it already be put together with the discs when I get it in the mail? Thanks! to put in with it. dont reuse your original ones most of the time because they’ve been beat on and have wear and tear. i recently upgraded my whole rear-end and added a posi-loc with 3.73 gears on my v6, and just bought some 245/50/16’s and it grabs the pavement and even puts me in the seat most of the time. ive put some into the motor and trans too tho so yea thats my input. gl mustang fanatics. I completely understand that I have to buy gears, but my question has still not been answered. Adam – I’m sorry it took me so long to reply to your question! According to Ford Racing, that kit does come assembled, but as James mentioned – it does not come with gears which you already know. I hope this helps and as always – let me know if you have any other questions! Heather, I asked a question about my 4.6 choking down on acceleration about a month ago, This is 3/10/10, I did not as of yet get a response. I don’t know if I did everything right or not. Please respond.